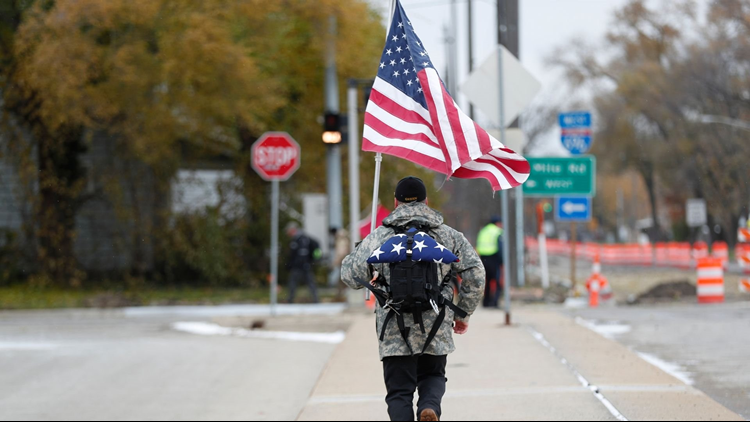 Army veteran Sean Green carries the American flag and runs across I-696 overpass with his rucksacks towards Royal Oak VFW Park during the 22 Ruck March in Royal Oak, Saturday, Nov. 10, 2018. All funds raised from the event go toward The Michigan World War II Legacy Memorial, and food donations are sent to Vietnam Veterans of America Chapter 15 Support Center. Lance Hoey and his 15-year-old son, Connor, marched Saturday morning through three Oakland County cities hauling 22-pound rucksacks in subfreezing temperature with wind and snow whipping their faces. The Hoeys, of Allen Park, and scores of other people — including Royal Oak Mayor Michael Fournier — participated in the the 5k Ruck 22 March to raise awareness of the roughly 22 U.S. veteran suicides that occur daily and to reflect on the sacrifices military members and their families make to serve. Fournier commended those who braved the mid 20-degree cold to attend the event. U.S. Army Sgt. Robert Robinson, 30, said he comes from a multi-generational military family and founded the event because he took issue with the high suicide rates of veterans. This year, Hazel Park and Ferndale joined as well. Robinson said he spread the word through social media and posting flyers. All funds raised from the event go toward The Michigan World War II Legacy Memorial, and food donations are sent to Vietnam Veterans of America Chapter 15 Support Center, Robinson said. Royal Oak resident Brennan Mills, 29, marched with his wife, two friends and Great Dane. Mills, who has two veteran brothers and is in the police academy, said more needs to be done to ensure soldiers are well taken care of when returning from combat. “Lending an ear can go a long way,” he said.